Wireless charging is quickly becoming a big deal these days, with many flagship devices now offering built-in wireless charging capabilities. The Samsung’s entire line of flagship Galaxy devices all offer this, with the newer models even supporting speedier wireless charging. I was first introduced to wireless charging with my old Nexus 5, and I’ve been happily using this method for charging my devices ever since. With my Galaxy S6 Edge, it gets its nightly charge this way as well from the Samsung wireless charging pad that was made available this year to go along with the Galaxy S6 and Galaxy S6 Edge. 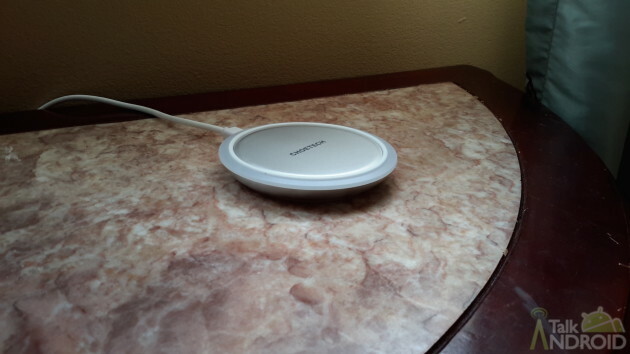 So now I’m trying out a new, third-party wireless charger on the market: the Choetech Circle. 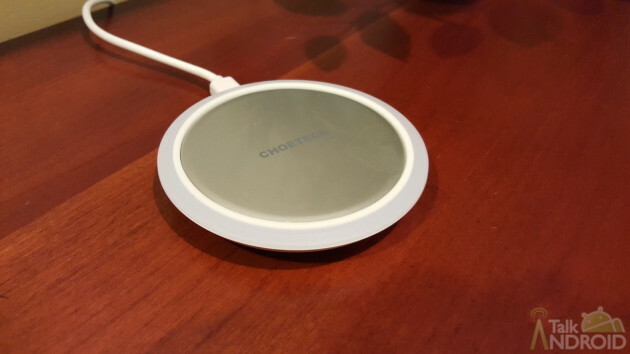 Choetech’s Circle Qi wireless charger has some interesting features to go along with the wireless charging. Most notably, it has an ambient light sensor that detects the room’s brightness and adjusts the charging LED accordingly. So if your room is dimly lit, the Circle will dim the charging light. Like pitch black while you sleep? No problem, the Circle will turn off the charging light altogether. Dimensions wise, it’s the size of a coffee mug coaster, except a little bit taller obviously. It’s also pretty light weight, but you don’t have to worry about it moving around because it has a circular rubber grip on the bottom of it. In terms of how much charge you get out of this thing, Choetech states the charger has an output of 5 volts at 1 ampere. The Samsung wireless charger is 5 volts at 2 amperes. And, because I know hardly anyone runs around with these super fragile Galaxy S6s, both will charge through your case, unlike my old Nexus 5 and its Nexus wireless charging block. Here are some tests I did of both the Choetech Circle and the Samsung wireless charging pad. All tests were done during a timed 30 minutes of charging with a few days in between and after various restarts of the Galaxy S6 Edge. Some other good things going for the Choetech Circle is that it’s about $10 cheaper than the Samsung one. What’s more, and this is most important to me, is that I did not have to worry about waking up to a dead phone. For some reason, my Samsung charger likes to stop charging at 100% but never bothers to restart the charging (sometimes I wake up and my phone is in the 70% zone and says it hasn’t been charging for six hours). I used the Choetech Circle for a week and this never happened; however, that could just mean that it never stops charging once at 100% and this could be a bad thing for your battery after long term usage. As far as the ambient light sensor is concerned? It works and, no, I didn’t feel like it was gimmicky. I am a big advocate of cutting down on blue wavelength light close to sleep time in order to promote better sleeping, so I liked that this thing dimmed or shut off entirely its blue LED charging light. The only complaint I have against this third-party charger is that it did not come with a wall outlet adapter. Ironically, I had to use the one from my Samsung charging pad. 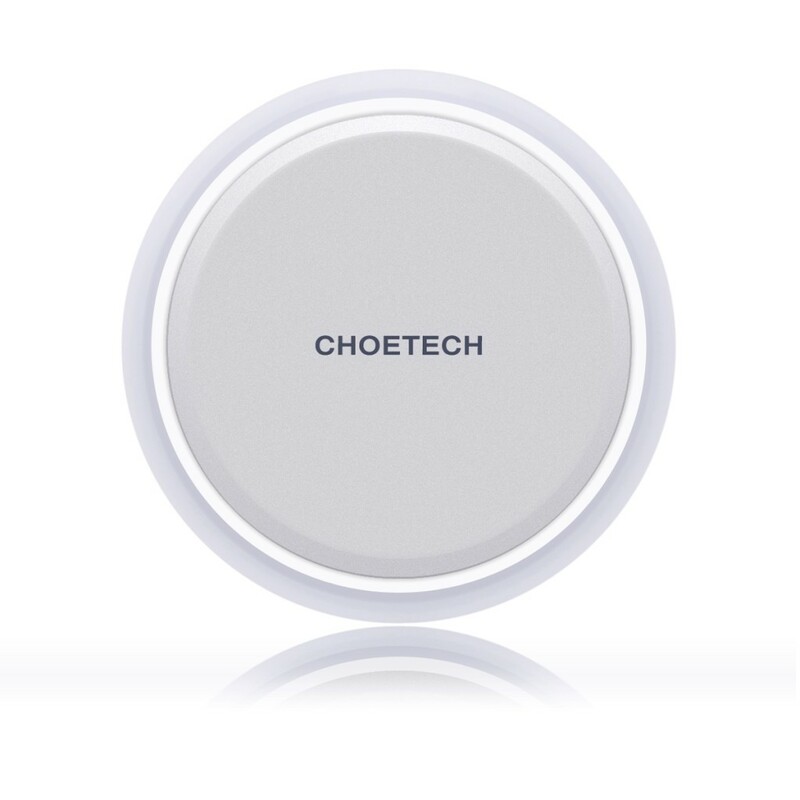 Overall, if you have a bunch of wall outlet adapters lying around, you do want to cut down on some obnoxious LED lights while trying to keep your eyes closed, and you want a good, reliable wireless charger that’ll also not put a dent in your wallet, I couldn’t recommend the Choetech Circle more. Choetech claims you can buy this in silver or black, but I was provided with a silver one and I’ve only seen the silver one on Amazon. The Amazon link to this product is included below. Hello will the charing Pad work with my Samsung Galaxy S3 phone ? How about other QI-enabled devices ? Dear , this is Cara from Shenzhen China, we are factory and specializing in wireless charger, we have new mould these days, it would be good to your sales. It won’t charge my 7 Plus? I have the blue light flashing but no charging? It won’t charge my 6s Plus. I have the blue light flashing but no charging?